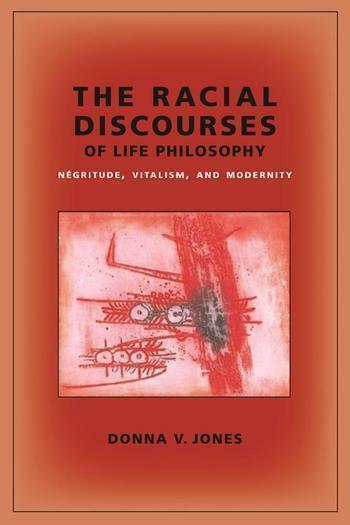 Q: The title of the book is The Racial Discourses of Life Philosophy: Négritude, Vitalism, and Modernity. What does the title tell us about the book? Donna V. Jones: The Great War was a catastrophic shock to world civilization. I am interested in how that shock reverberated both in European philosophy and in the thought of colonial subjects, especially among a group of African and Afro-Caribbean thinkers from the French colonies who formed a poetic movement called Négritude. The rationalization of slaughter raised the question of what value Western civilization actually placed on life, but the fascist reaction to the horrors of the First World War also gave new meaning to life and identified it with death. We find an obsession with intense lived experience of the battlefield and an irrational commitment to the vitality of the nation, predicated on the racist destruction of life that is weak. The bully boys found that there was no better way to silence the reasonable criticism of an opponent than to paint him as against life. Life became a political banner, but we find a very different response to the crisis of the interwar years in the Négritude poets. Following the lead of F. Abiola Irele, I argue that it is illuminating to read them in dialogue with the great life philosopher Henri Bergson, whose influence on the arts of his day surpasses that of any philosopher after him, and in the book I am interested in Bergson’s influence on modernism in general. I focus, however, on the two extraordinary Négritude poets who were also leading statesmen, Aimé Césaire and Leopold Sédar Senghor, and show that their interpretation and development of Bergson’s life philosophy were profound indeed. However, I insist that Césaire alone found the proper limits of life philosophies. The irony here is that both imperialist racialism and anticolonial revolt are implicated in life philosophy. Q: What, then, is life philosophy or vitalism? D.V.J. : It’s a deceptively simple answer to two ancient questions: What ought we do, and what is the good life? Vitalism (and there are many forms of it, but I shall begin here) names the temptation and tautology to seek in the nature of life itself an answer to basic ethical questions. Life ought to be for life and the good life is the lively life. We have so much reverence and awe for the life process of which we are but an evanescent product that we cannot but consult it. Should not life itself, then, hold the answer to what life is for? It is not even clear that we have anywhere else to turn. But do life itself and our existential dependence on it really provide any clues whatsoever to what are our individual lives are for? The common answer that follows even today is discomforting in light of the fascist historic use of the life concept, to say the least: life is for more life—reproductive fitness: power, mating, and progeny. We have no other purpose. Now it is well known that racial dystopias have been created in the name of health, vigor, and vitality. Life itself was thought to hold the answer to the question of which lives are not worth living in the Lebensphilosophie favored by fascism. At the end of my last chapter I read Césaire’s Notebook of a Return to My Native Land as an affirmation of all black existence in what Judith Butler would call its precariousness, in opposition to the strong man’s embrace of only that which is vital. Q: You say that vitalism has had other forms. What would be examples of those? D.V.J. : Yes, life has not always been understood naturalistically or in terms of biopower. Life has also been understood in experiential and spiritual terms. Experience, for example, is something lived, and life is experienced beyond what can be expressed through the mediations of classification, reason, science, and even language itself (I consider life as contrastive to all these categories through readings of the modernists Ezra Pound, D.H. Lawrence, and Gertrude Stein and the philosopher Ernst Cassirer). Life is that which is both most intimate and opaque to us. While I am quite critical of Senghor, he wrote powerfully of the limits of the mediations through which is life is known, and I differentiate between Senghor’s critique of intellectualism from the perspective of lived experience and an outright hostility to the demands of reason from the standpoint of life. I coin the phrase “the strobe light theory of the intellect” to indicate that what is criticized is not necessarily the attempt at understanding but the limits of the intellect’s ability to shine light on and thus apprehend the open movement of life. So the limits of the intellect do not imply the limits of understanding anchored in intuition, and Senghor famously located the core of African personality in its intuitive capacities. Defying intellectualization, life is often considered as the harbinger of what does not yet exist objectively, and when behavior loses its grounding in life, it becomes mechanical and, as a result, comic. Bergson in fact developed a vitalist theory of comedy which I consider at some length. Life is creative force—what Bergson would call the élan vital. Life is beyond the intellect, and it is also always already beyond the world as it is (yet for Gilles Deleuze life is still immanent to the world). If the critical idealist sees the world as composed of objects and ideas, then the vitalist understands the world as composed of objects and vital forces or spirits, which are often taken to be the primary reality. The question for the vitalist is not about how to represent but how to identify with such an immanent élan vital. Q: How then do you connect vitalist philosophy and racial discourse? D.V.J. : I connect them through my neologism “mnemic vitalism.” Bergson understands life in terms of durée or duration, yet he is widely celebrated as a philosopher of creativity and openness. But if life is distinguished by memory and duration, then to live or live truly or authentically is, now paraphrasing Bergson, to recoil the personality on itself, gather up the past, which is slipping away, in order to thrust it, compact and undivided, into a present that it will create by entering. And this kind of active recovery of core values is exactly what European ethnic nationalists and the Négritude poets understood themselves to be doing. The basic idea here is that we are born nominal heirs only, and we must actively recover our cultural inheritance in a modern world hostile to it. Let me be clear here. I do not read Bergson himself as a racialist (his theory is ultimately too subjectivist for that), but drawing from the pathbreaking studies by Mark Antliff of Bergson’s influence on aesthetic, political, and nationalist movements, I explore the connection between Bergson’s ideas and understandings of self and culture rooted in racial conceptions of deep ethnological time. I also write about the connections between life philosophies and anti-Semitism. In fascist discourse the Jew is painted as the enemy of life. The life process depends on production but in a money economy production needs to be financed; production has to answer to an abstract monetary demand on pains of losing financing (was it profitable? ); and its results can’t be put to human use unless the purchaser has money. Life can be held hostage by money. The banks can be usurious; they can withdraw capital and refuse loans. In anti-Semitic discourse the Aryan is identified with creative production and money is arbitrarily associated with the figure of the Jew (here the poetry of Ezra Pound is instructive) . The Aryan embodies the life principle and the Jew embodies the abstraction inherent in money and death. The Frankfurt School thinkers who (as I show) were otherwise sympathetic to vitalism obviously could not become irrationalists in the face of such connections. But note the way in which Négritude identified the intuitive African with life is fundamentally different from the way in which strong Aryan embodied life in fascist Lebensphilosophie. Q: How do you see vitalist discourse today? D.V.J. : As I say in my introduction, many of our most pressing questions center on the question of life: the value of biodiversity as we approach rates of extinction unknown since the days of the dinosaurs, the commodification of life from organs to the genome, the tinkering with life, the consanguinity of life forms and the status of animal rights, the question of health care as a human right, and the autonomy of biology vis-à-vis the physical and chemical sciences. We will continue to talk about and query life. And we can do this best if we remember how and why vitalism went astray in the past, so I hope that my book will be welcomed both by critics and exponents of vitalism. I am concerned that vitalism will oppose in the name of openness, creativity, and life the controls intended to make our social life morally intelligible or rational (the élan vital is what the entrepreneur of the free market claims to embody); I am also not convinced of the coherence or desirability of the vitalist critique of the intellect, for it only leads back to a world of private concern and experience. Ethnic nationalism has been connected to mnemic vitalism; racial dystopias have resulted from masculinist biopolitical projects of vigor and vitality; and solipsism follows from the vitalist skepticism of communicative language to capture private lived experience. So as a black woman committed to some aspects of the Enlightenment, I have found myself distrustful of, yet still open to, life.